Wednesday was the shortest day of the year, which means we are usually dealing with some pretty chilly temperatures, but it was unseasonably warm. That did not deter us from preparing this cold weather meal, and it will definitely go into the vault to be made again to warm our bones. The potato pancakes were a lot of fun. Jon added Parmesan, salt and pepper to the original recipe and cooked them up on our counter-top electric griddle, which makes it seem like camping or grilling indoors. 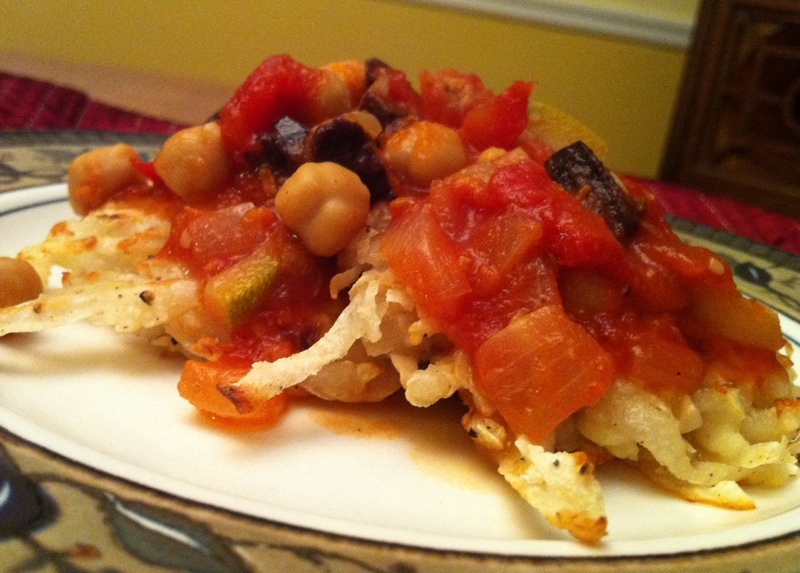 The hearty vegetable stew could have stood alone, but piled over the potato pancakes made for an extra special treat. By the way, you should know, I would put olives in everything if I could, but they are especially delightful in this stew. Heat oil in heavy large saucepan over medium-high heat. Add onion; sauté until tender, about 5 minutes. Add next 4 ingredients; stir 1 minute. Add zucchini and tomatoes with juices; bring to boil. Reduce heat and simmer until zucchini is tender, stirring occasionally, about 10 minutes. Add garbanzos and olives; simmer 3 minutes. Mix first 3 ingredients in bowl. Season with salt and pepper. Working in batches, spray large nonstick skillet with nonstick spray; add 1 teaspoon oil. Heat over medium-high heat. Add potato mixture by 1/3 cupfuls, spreading each to 3-inch round. Cook until pancakes are brown, about 5 minutes per side. Place pancakes on plates. Spoon stew over and serve.